Outdoor spot light base kit. Power supply and plug included. 700 lumens per each Spot. Suitable for use in wet locations. Includes 3 Spots, PSU with 2.9m cable, 2 connectors, 3 x 5m extension cables, 3 spike and wall mounts. Add style and enhance the beauty of your home and landscape with this professional quality cast aluminum 6 pcs walklight kit. UV protected black paint finish and heat resistant lens provide long life. This box includes 6 black cast aluminum walklight fixtures, 6x 4W incandescent wedge base bulbs, 12 inch SPT-1 18 gauge cable with easy quick-clip connector, 40W transformer with photocell and timer, 50ft SPT-2W 18 gauge landscape wire. Add style and enhance the beauty of your home and landscape with this professional quality cast aluminum down light to illuminate pathways and low lying greenery.. UV protected black paint finish provides long life. This box includes 1 cast aluminum down light, 1x 11W wedge base bulb, 12 inch SPT-1 18 gauge cable with easy quick-clip connector. Hue White and Colour Ambiance Lily Outdoor Spot Light 3PK Base Kit - Black Finish Plug in and light up your outdoors. Conveniently illuminate and personalize your outdoor space, tune the light level to your need of the day, creating the right ambiance to fully enjoy your moments. Hue White and Colour Ambiance Lily Outdoor Spot Light 3PK Base Kit - Black Finish is rated 5.0 out of 5 by 7. Rated 5 out of 5 by Mg from These lights came early. Are just what I expected. Can... These lights came early. Are just what I expected. Can not wait to get them installed. Rated 5 out of 5 by Dustin from These outdoor lights are very bright and integrate flawlessly with... These outdoor lights are very bright and integrate flawlessly with my Philips Hue bridge inside. The color changing features make decorating for holidays and special occasions a snap. I love these lights and am ordering a second set. 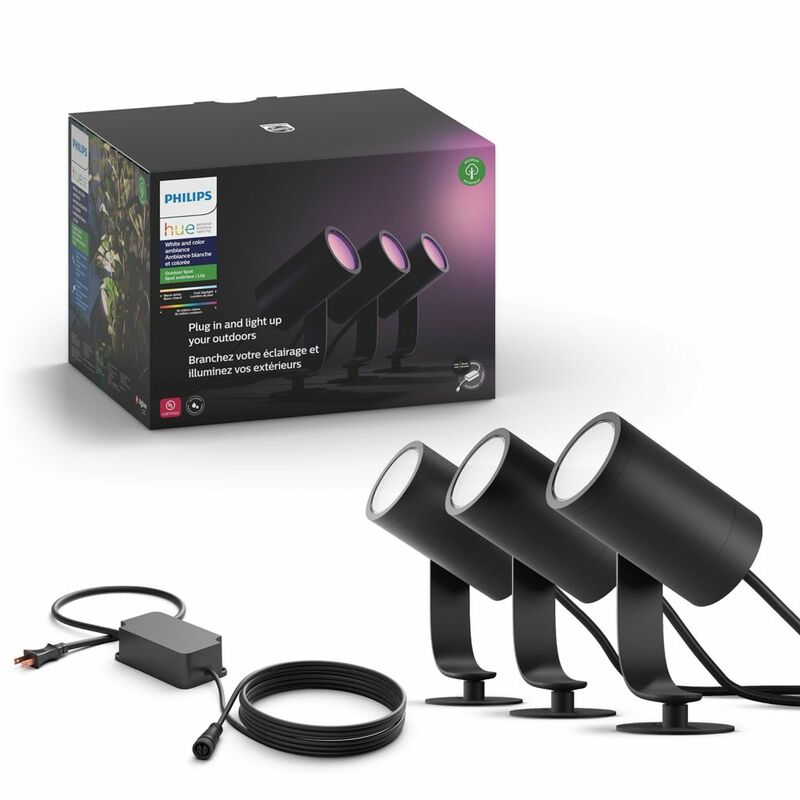 Rated 5 out of 5 by William from Hue Outdoor Spot Light Kit This is my second kit. Installs quickly. Connecting to the hue bridge was easy but easier if you type in the serial number of each lamp. The lights are bright and changing the colour to your whatever shade was a snap. Make sure you sink your Hue app to your Smart Hub ( I have Wink2 Hub) so you can control your lights from anywhere. So far I am extremely happy with this purchase. Rated 5 out of 5 by Poison67 from Hue Lily We had been getting quotes for outdoor lighting which were ending up in the tens of thousands of dollars. I saw these online and did some research and thought that I would try them out with the starter kit. I did all of the installation (by myself!) in about 15 minutes. We now have beautiful lighting along the front of our house and change the colour depending on the occasion, weather etc. People loved it on Halloween when the house was orange. I will be adding several more to the property in the spring, including the Cala lights. We used to pay a lot for professional lights for Christmas but NO MORE! So far, so good: No problems.